i got a Popup and inside this popup is the Homepage, how to configure it back to just open a new separated Windows (new tab)? Please post a link to an example on your site. but why this iframe happen, or how to switch it off to have a "normal" link like on your post? Are you trying to create just a link, or a lightbox popup of the link? Go to Editor Profiles -> Plugin Parameters -> Link, and scroll down to the Popups section. Make sure the Default option is set to Not Set. Same problem, even with Option Not Set the link always ad JCE MediaBox Popups. Free version JCE had no problem like that. 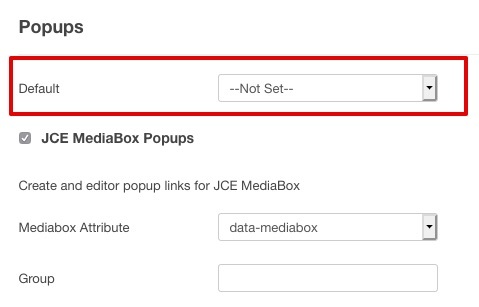 @Valery_D - When you open the Link dialog, and click on the Popups tab, is the Popup Type option set to JCE MediaBox? Or, are the links you are creating opening as popups in the front-end after creating / saving content? It's all the time as option in dialog. I have fixed this on your site, by it is the result of a bug in JCE Pro 2.7.6 which will be fixed in the next update. Thank you! But know it's new problem. If I do edit (update link) bad link with popup on it - link totally disappear. New created link OK, works fine, can be update. I keep login for you.